Take a step back in time and meet “Legendary Ladies: Unconventional Women of the West.” This unique event happens at 10 a.m. Friday, Aug. 18, 2017, at the Mesa County Libraries Central Library, 442 N. 6th St. in Grand Junction. Katharine Lee Bates, inspired to write America the Beautiful after a visit to Pikes Peak, portrayed by Kyle Neidt. The performance is open to the public at no charge. Seating is limited. 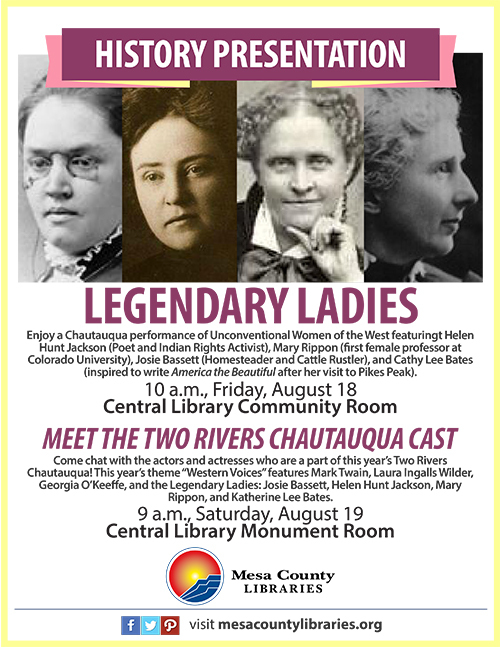 Actors and actresses taking part in this year’s Two Rivers Chautauqua event will be available to meet the public at 9 a.m. Saturday, Aug. 19, 2017, at the Mesa County Libraries Central Library, 443 N. 6th St. in Grand Junction. This year’s Chautauqua theme is “Western Voices,” and cast members will portray historical figures such as Mark Twain, Laura Ingalls Wilder, Georgia O’Keeffe, and the “Legendary Ladies”: Josie Bassett, Katharine Lee Bates, Mary Rippon, and Helen Hunt Jackson. This meet-and-greet event is open to the public at no charge.